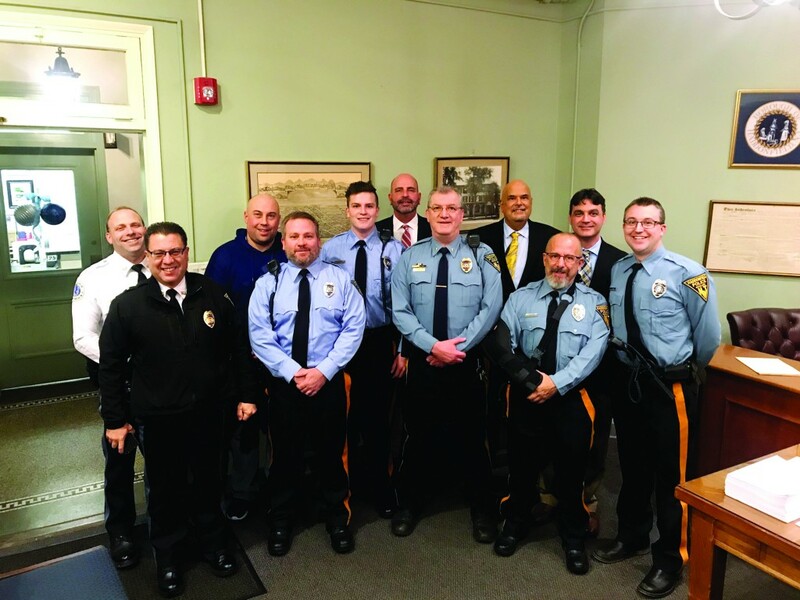 Members of Haddonfield’s Auxiliary Police Department were sworn in during the Jan. 16 Board of Commissioners Meeting. Front Row, from left to right: Lt. Stephen Camiscioli, Aux. Officer Steve Luecke, Aux. Lieutenant Jack Matty, Aux. Officer John Curatola, Aux. Officer Kyle Erdner. Back Row, from left to right: Chief Jason Cutler, Aux. Officer Ryan Gade, Aux. Officer Sean Kyser, Commissioner Jeffrey Kasko, Mayor Neal Rochford, Commissioner John Moscatelli. A light schedule marked the first Haddonfield Board of Commissioners meeting of the new year, where appointments were made to the borough’s Auxiliary Police Department. Each will expire in December. The 11 members appointed for the year were Steven F. Harski, captain; Jack Matty, Jr., lieutenant; Timothy A. Chase, sergeant; and Frederick W. Chase; John Curatola; Peter Dobush; Kyle Erdner; Richard Ryan Gade; Eugene Haag; Sean Kyser and Steve Luecke. The Auxiliary Police Department is made up of volunteers and has operated since the 1940s. It was originally set up during World War II as a way for the borough to cope with losing residents and law enforcement to the war effort. “We’re one of the only ones left in South Jersey that is still operating. We’re proud of them. They provide an invaluable service to the community,” said Haddonfield Police Chief Jason Cutler. The Auxiliary Police are primarily utilized for parades, traffic duty and for instances of tree damage to overhead wires in the middle of the night, where it will be called to stand watch while the electric company performs repairs, Cutler said. The department is comprised of approximately 12 to 14 members, who are appointed on a yearly basis, but all who serve are welcome back as long as they wish. The Board of Commissioners also unanimously passed a resolution to sign a shared services agreement between the board of education and the borough for the shared use of the greenhouse, storage shed and Cooley Hall located on the Bancroft Hall lot. The board had unanimously passed a resolution at its Oct. 23 meeting to adopt a memorandum of understanding with the school board regarding a future land swap that involved portions of the Bancroft lot. At that time, Commissioner John Moscatelli said the process to reach a binding agreement would take an unspecified number of months to resolve, as both sides had to work through bureaucratic measures. No further update was provided on the process at the meeting. Mayor Neal Rochford read a proclamation declaring January “School Board Recognition Month” in honor and recognition of contributions by local school board members, past and present. John Springer, a Haddonfield Memorial High School senior, was sworn in as a member of Haddon Fire Company №1, while HMHS junior Philip Edmunston was sworn in to the fire department’s Explorer Program. Cassandra Eattock, who attended the meeting with daughter Lindsey, was honored by the Commissioners for providing the winning entry in the online naming contest for the Police Department’s new member of its K-9 unit. Additional resolutions were also passed authorizing the use of Kings Court for the Haddonfield Farmers Market from May 19 through Oct. 12; extending the contract with Voorhees Animal Orphanage in Voorhees to provide housing services for stray domestic animals within the municipality for an additional two-year period through Dec. 31, 2020, at a rate of $350 per month; and extending the contract with Independent Animal Care Services, LLC of Lindenwold as the borough’s animal control officer through Dec. 31 in the amount of $700 per month and $50 per call in overtime hours.